The first Running of the Bulls of Sanfermin 2017 turned out to be a thrilling and complicated event, with several moments of danger and 3 horn injuries. The experience of previous years had indicated that this first Running of the Bulls of 2017 would be very risky and complicated and the Cebadas have fulfilled the challenge. The Cebada Gago bulls, holding the record for causing the highest number of injuries to runners in all the recent history of the Sanfermin bullrunnings, seem to have only gored three runners in this year’s event – one goring took place on the Santo Domingo stretch, the other one occurred at the City Hall stretch and the last one in Estafeta. According to the medical services from the Navarra Hospital Complex,the third runner, the one that was caught in Estafeta is in serious condition. Contrary to earlier runs made by this bull-breed and which used to last several minutes on average, this year’s Running of the Bulls took just 2 min. 58 sec. The exit from the pens began at a stuttering pace as the bell-oxen ran at a very slow pace. As the pack began to run up the Santo Domingo slope, the bulls started to pull ahead towards the right side, especially one black bull which threatened the runners near the fence and where it finally caused the first gorings of this first bullrunning of 2017. The bulls began to make some spectacular running once they had passed the corner of Mercaderes and the Cebada Gago pack stood out for their different-colored coats and where a light khaki- colored bull led the way. The runners also managed to keep close order along the course which made for a largely clean running in front of the horns of the bulls. Although the bulls came out of the pens at Santo Domingo in close order, by the end of this first stretch they began to go their own way and a couple of runners were knocked over at the corner of Mercaderes. By the final stretch, the bulls were well stretched out and they all arrived separately to the bullring where they were quickly led away to the pens without more ado. ¿How is a bull like from up close? 30 running bulls. 56 goring. 113 traumatisms. In 28 participations the Cebada Gago have caused 53 gorings (1,89 per running of the bulls). Cebada Gago is the 6 bull-ranch with the highest average of gorings (1,89 per running of the bulls). 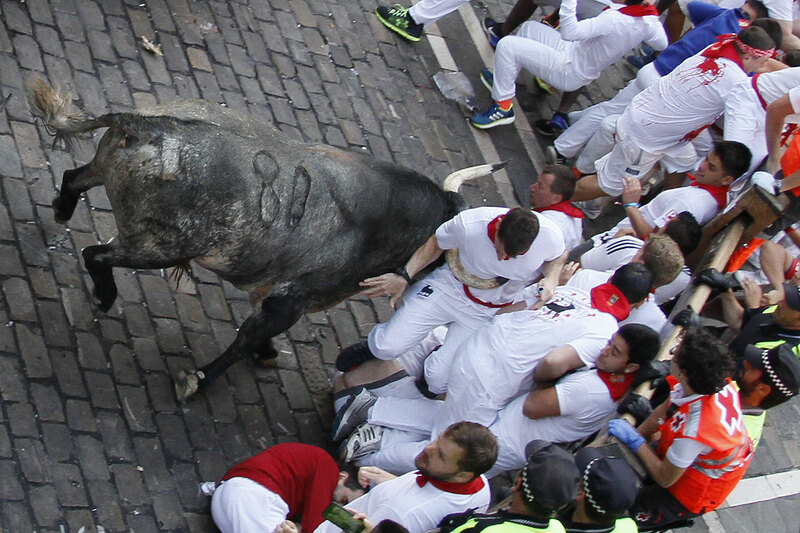 In 28 participations the Cebada Gago have caused 108 injuries from bruising (3,86 per running of the bulls). On Friday the stretch with the most gorings is Callejón (13 in 41 runnings). On Friday the stretch with the least number of gorings is Ayuntamiento (2 in 41 runnings).